Pantelion Films, the joint venture between Lionsgate and Televisa, announced with Distant Horizon that Pantelion will release the Spanish-language family comedy “UN PADRE NO TAN PADRE” on January 27, 2017 in the U.S.
Set in the stately and majestic colonial city of San Miguel de Allende, this quirky comedy starring Héctor Bonilla, Benny Ibarra de Llano, Jacqueline Bracamontes and Sergio Mayer Mori, follows 85-year old Don Servando Villegas (Héctor Bonilla,) an old fashioned Mexican patriarch who gets kicked out of his retirement home for bad behavior. 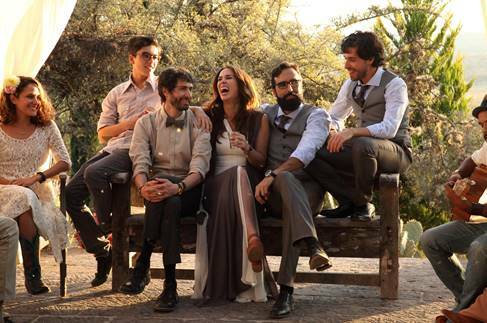 When his estranged son, Francisco (Benny Ibarra de Llano) is forced to take him into the house full of hippies he shares with his girlfriend and young son, “new age” collides with old age as Don Servando and his son Francisco experience a series of conflicts and situations that puts their home’s stability in jeopardy. “Un Padre No Tan Padre” is a story about family: the one we’re born into and the one we create along the way.The film is directed by Raúl Martinez and produced by Gerardo Gatica’s Panorama Global, Alberto Müfflemann and Moises Cosió. The film is executive produced by Distant Horizon’s Anant Singh and Brian Cox. Anant Singh, President of Distant Horizon said, “‘Un Padre No Tan Padre’ is a hugely entertaining film and we are delighted to be partnering with Pantelion Films to bring it to the US Latin audience, a market in which they are leaders and have a successful track record. We are pleased to be continuing our relationship with Gerardo Gatica and Alberto Müfflemann at Panorama Global, with whom we previously co-produced “ ‘Kite’ ” and “‘Remember.’ ”The film will open in Mexico on Dec. 24 via Cinépolis Distribución and Pantelion Films/Lionsgate will release on Jan. 27, 2017 in the U.S.